With her fiery locks and flashing smile German soldier Kati Wilhelm may be taking a final bow on the biggest stage at Vancouver, but with two world biathlon titles in 2008-09 don't expect the veteran sharp-shooter to go out quietly. The pre-Olympic season also brought Willhelm world silver medals in the pursuit and relay (to go with the golds in sprint and individual) and a second place in the World Cup overall, trailing only Sweden's Helena Jonsson by victories after the two women finished level on points. Ahead of her final massive challenge, she stands on six Olympic medals (3 gold, 3 silver) and 13 world championship medals (5 gold, 4 silver, 4 bronze). She also goes into her final season with one World Cup overall title won in 2006 and three runner-up places in 2005, 2007 and 2009. Wilhelm was born in Schmalkalden, a town of 18,000 inhabitants in the old East Germany on the wooded slopes of Thuringe, where incidentally Sven Fischer the double biathlon world champion and Salt Lake City silver medallist also comes from. Easily recognisable by her broad smile and flame red-dyed hair, she began skiing cross-country as a youngster. She left school in 1995 and joined the Bundeswehr, the German army, where she gained the skiing experience that would later help make her a champion. She started the biathlon in 1999 almost by accident. She was taking part at the military world championships and was invited to have a go at a target range where her precise marksmanship sparked a shift to biathlon from cross-country. 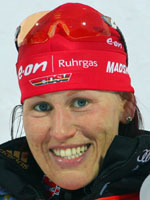 A first World Cup victory in the 2001 season marked her first real breakthrough, confirmed with a world championship gold medal in the pursuit at Pokljuka, Slovenia. In 2002, she won the title every athlete dreams of, claiming Olympic golds at the Salt Lake Games in the sprint and relay as well as a silver in pursuit. Wilhelm suffered a bit of a dip in form following her Olympic exploits, which prompted the decision to relocate to Ruhpolding in Bavaria, one of the best known venues on the World Cup circuit. The move paid immediate dividends and at the Turin Games in 2006, there was more success in the pursuit race while the German also pocketed silver in the mass start and relay events. One of her best seasons to date also saw Wilhelm win the World Cup overall title to erase the disappointment of finishing in second in 2005. The motivation of more Olympic glory appears to have given her renewed desire to finish her career at the top. And the talent is obviously there after winning two more world titles in 2009. Promising results as she gets set to head to the rugged West Coast of Canada and a chance for her fans to get at least one last glimpse of her skills and smile.